Proper reclamation once the harvest is complete increases the long-term value of the property. Things look pretty rough right now. This is the main skid trail into the landing and it has seen a lot of wear and tear. 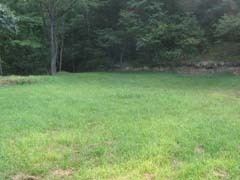 These pictures show the same areas above after being reclaimed. Now, let's take a look at the reclamation process. Successful reclamation takes time and effort to get these kinds of results. The landing, where the logs are worked up and loaded out, receives the most wear and tear during the harvest. Materials not suited for sale, called "chunks", are hauled away for firewood. The dozer levels the area and makes sure water will drain off. Trails correctly "Put to Bed" will not erode and provide years of recreational enjoyment until the next harvest. The trails are leveled and the outside berm is removed to let water runoff. Water bars and broad-based dips are installed along the trail to help minimize erosion during rain storms. Once the landing and trails are smoothed up and properly drained, it is time to apply the wildlife seed mixture. A little fertilizer and hay mulch give the seed a good start. The haul roads are smoothed up and some fresh stone is applied where needed to bring the road back to original (or better) condition. Everyone benefits from a job well done....the landowner, logger, forester and the resident wildlife.